Hofer, Skylar Wehri). Similarly, my assistant coaches were guiding the debaters when I was en route to keep them focused on the competition. Both events produced positive results. In Watertown, the debaters won 1st place honors in their division. In Sioux Falls, those supporting my candidacy used the agreed upon procedures to share their views about my candidacy in a positive and sincere way. 5NE District Governer Katherine Tweed (R) spoke on my behalf at the SD Past District Governor’s Breakfast. I couldn’t be prouder of the way both teams conducted themselves and presented our candidacy to the Lions of South Dakota. 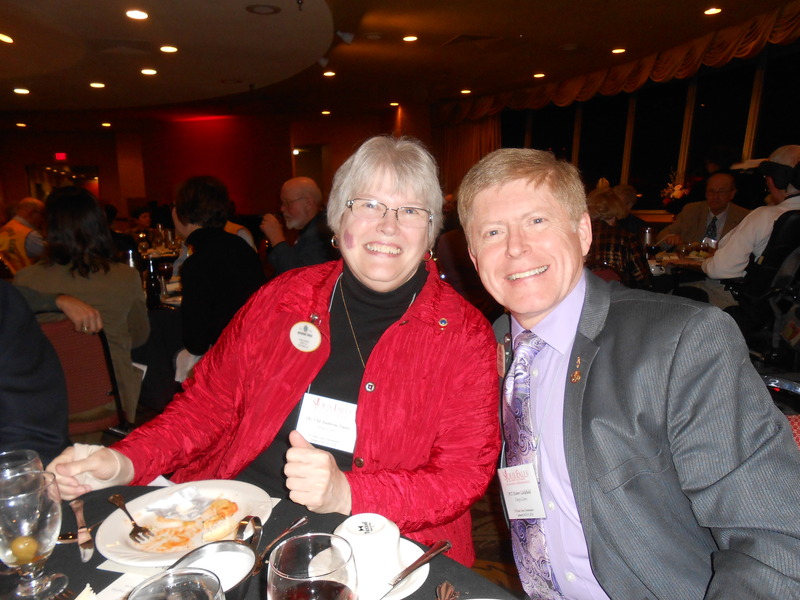 Past District Governors Kevin and Pat Vannett (L) and Lions Kim and Past District Governor Mel Olson (R) joined me and my wife, Kathy (C) at the banquet on Saturday night to celebrate Lionism and the support of all of our South Dakota Lion friends. International Director John Harper was the featured speaker and two Lions (Carol Becker and PDG Ray Schley) were inducted into the SD Lions Hall of Fame. Congratulations to both! With the close of the SD State Lions Convention came the end of the first phase of the campaign for the International Director endorsement. All of the four state/provincial conventions enabled both of us to present our candidacies to the Lions of Multiple District 5. But now, it is time to begin focusing more specifically about why the delegates should endorse one candidate over the other. In other words, why should the Lions of MD5 endorse PCC Robert Littlefield instead of PCC Tom Grimmond? 1) International Scholar and Presenter: I am an internationally recognized communication scholar who has presented speeches and programs at conferences in Germany, Japan, the Netherlands, and Canada. My international focus as a Lion is shown by my attendance at six international conventions and three USA/Canada Forums. 2) National Leadership Experience: I have served as a national president of one of the largest collegiate speech and debate organizations–Pi Kappa Delta–and national secretary-treasurer of the American Forensic Association. In addition, I am advisor for the National Junior Forensic League and the National Speech and Debate Association. 3) Respected Educator: With a doctorate in speech communication, specializing in intercultural communication, I have been a member of the faculty at North Dakota State University since 1979. I have authored or edited five books, written over 75 scholarly publications, and presented over 100 papers at academic conferences. 4) Effective Communication Skills: Whether at the platform presenting a speech to a large audience or talking informally over a cup of coffee, my communication skills have been recognized as an asset enabling me to listen and respond to the concerns of others. Additionally, my wife, Kathy is a high school social studies teacher who can address large and small groups with poise and confidence. 5) Successful Advocate and Leader for Lionism: Since 1984, I have been an advocate for the programs and positions introduced by Lions Clubs International. From Journey for Sight, to SightFirst II, to Global Leadership and Membership Teams, to Extension Initiatives to Recruit Women and Youth, to Club Excellence, to Guiding Lion Certification, my focus has been to help my club, district, and multiple district put international programs into action. But let’s not stop at five. I believe that empowering young people to speak up for service and get involved in service activities is the most important thing that Lions can do to strengthen the foundation of our association. Young people are not the future; they are the present and we need to embrace them and encourage them. My commitment to youth is at the heart of why I should be endorsed as a candidate for international director. My life has demonstrated this commitment and I pledge to do my best to help Lions Clubs International move into its second century with a focus on involving and empowering young people to embrace and live the principles of Lionsim. Yes, there are many joys in my life. Competition is one of them and it’s time that the Lions of MD5 learn more about why I am passionate about service and committed to doing my very best to represent them and the Lions of the United States as an International Director.